Idiopathic membranous nephropathy (IMN) is the most common cause of nephrotic syndrome in adults. Universal consensus regarding the need for and the modality of therapy has not been formed because of a lack of controlled trials of sufficient size, quality, and duration. This study compared the effect of a 6-mo course of alternating prednisolone and cyclophosphamide with supportive treatment in adults with nephrotic syndrome caused by IMN on doubling of serum creatinine, development of ESRD, and quality of life in a randomized, controlled trial. Patients were followed up for 10 yr. Data were analyzed on an intention-to-treat basis. A total of 93 patients completed the study. Of the 47 patients who received the experimental protocol, 34 achieved remission (15 complete and 19 partial), compared with 16 (five complete, 11 partial) of 46 in the control group (P < 0.0001). The 10-yr dialysis-free survival was 89 and 65% (P = 0.016), and the likelihood of survival without death, dialysis, and doubling of serum creatinine were 79 and 44% (P = 0.0006) in the two groups. Treated patients exhibited significantly lower prevalence of edema, hypertension, hypoalbuminemia, hyperlipidemia that required therapy, angiotensin-converting enzyme inhibitor/angiotensin II receptor blocker use, and better quality of life on follow-up. The incidence of infections was similar in the two groups. In conclusion, untreated IMN with nephrotic syndrome is associated with a high risk for deterioration of renal function. A 6-mo regimen of cyclophosphamide and steroids induces remissions in a high proportion, arrests progression of renal insufficiency, and improves quality of life. Idiopathic membranous nephropathy (IMN) is the most common cause of nephrotic syndrome in adults (1). Although clinical trials on therapy for this disease have spanned more than two decades, universal consensus regarding the need for and the modality of therapy to decrease proteinuria and halt the progression of renal disease does not exist (2). A number of therapeutic measures have been tried, including nonspecific antiproteinuric agents; corticosteroids, either alone or with alkylating agents; cyclosporine; intravenous Ig; mycophenolate mofetil; and rituximab (3–16). The only regimen that showed a clear short- and long-term benefit is the one that consists of a 6-mo course of alternating months of oral chlorambucil and corticosteroids (15,17). Others, however, have pointed to the relatively benign course of IMN (18) and favor a conservative approach. A recent systematic review (19) failed to find a beneficial effect of treatment on renal or patient survival. A major lacuna that limits the value of this meta-analysis is the lack of controlled trials of sufficient size, quality, and duration. Because ESRD usually develops only after 5 to 10 yr, studies that aim to evaluate the effect of treatment on development of ESRD need a sufficiently long follow-up. We conducted a randomized, controlled trial (RCT) of a combination of prednisolone and cyclophosphamide in IMN at our institute and report the 10-yr results of this intervention. This prospective, open-label, randomized study compared the experimental regimen with supportive therapy in adult (age ≥16 yr) patients with nephrotic syndrome caused by biopsy-proven IMN of at least 6 mo duration. Nephrotic syndrome was defined as proteinuria ≥3.5 g/d or ≥2.5 g/d along with serum albumin <2.5 g/dl, edema, and hyperlipidemia. Kidney biopsy was evaluated by light microscopy and immunofluorescence. Patients with systemic illness, malignancy, diabetes, hepatitis B surface antigen positivity, or renal vein thrombosis and those who had received steroids or immunosuppressive drugs for ≥2 mo were excluded from the study. The study was approved by the Institute Ethics Committee, and all patients provided written informed consent. Patients were divided into two groups using table of random numbers. Group 1 received supportive therapy that consisted of dietary sodium restriction, diuretics, and antihypertensive agents. Group 2 received a 6-mo course of alternate months of steroid and cyclophosphamide. The treatment regimen consisted of intravenous methylprednisolone 1 g/d for 3 consecutive days followed by oral prednisolone 0.5 mg/kg per d for 27 d in the first, third, and fifth months and oral cyclophosphamide at 2 mg/kg per d in the second, fourth, and sixth months. Angiotensin-converting enzyme inhibitors (ACEI) and angiotensin II receptor blockers (ARB) were withheld for at least 1 yr in both groups. Patients in group 1 were given the choice of opting for the immunosuppressive regimen 24 mo after randomization. Follow-up visits were scheduled every 2 wk for 2 mo, every month for 6 mo, and thereafter every 6 mo or more frequently when required. Parameters monitored included 24-h urinary protein and serum creatinine at each visit and serum albumin, cholesterol, and hemoglobin every 6 mo. Total leukocyte count was monitored every 2 wk when patients were on cyclophosphamide. It was withheld temporarily when the counts fell to <3500/mm3 until recovery to >4000/mm3. ACEI and ARB use was recorded. Hyperlipidemia was treated with dietary restrictions and, when required, statins and/or fibric acid derivatives. Remission was defined as complete (CR) when the proteinuria declined to <200 mg/d on at least three occasions and partial (PR) when proteinuria was >200 mg/d but <2 g/d or <50% of baseline, whichever was lower along with normal serum creatinine. Hypertension was defined as supine BP >140/90 mmHg. Treatment was halted in group 2 when a patient exhibited any evidence of active ulcer disease, neoplasm, diabetes, and/or life-threatening infections. Pregnant women were also withdrawn from the study. Patients were followed up for at least 10 yr. Study end points were doubling of serum creatinine, development of ESRD, or patient death. Quality of life was assessed using a visual analogue scale of 0 to 10, with 10 indicating the best quality of life. Data were analyzed on an intention-to-treat basis. Comparison of proteinuria, reciprocal of serum creatinine, and quality-of-life scores was made between groups using the Welch’s corrected t test and within a group using the Wilcoxon signed ranks test. The frequency of clinical and laboratory parameters between groups was compared using Fisher exact test. Survival curves were plotted by the Kaplan-Meier method and compared using the log rank test. The effect of various clinical parameters on remission was analyzed using the Cox proportional hazards method. A total of 104 patients were recruited from March 1993 to February 1995: 53 patients in group 1 and 51 in group 2. The baseline demographic and biochemical parameters at the start of the study (Table 1) were comparable between the groups. Histologic parameters in terms of stage of IMN, proportion of sclerosed glomeruli, and degree of tubular atrophy and interstitial fibrosis were also similar (data not shown). The majority of the patients had stage II IMN with minimal interstitial scarring. All patients who were assigned to group 2 completed the treatment protocol. Cyclophosphamide was temporarily withheld in three because of transient leucopenia and in two because of infections that required hospitalization. The follow-up duration ranged from 10.5 to 12 yr (median 11 yr). Eleven patients were lost to follow-up, seven and four from groups 1 and 2, respectively, between 18 and 48 mo of randomization and were excluded from analysis. A total of 16 patients in group 1 (five CR, 11 PR) and 34 in group 2 (15 CR, 19 PR) achieved remission (P < 0.0001). Initial remission was achieved within 1 yr of randomization in five and 15 patients in groups 1 and 2, respectively. The 10-yr dialysis-free survival was 65 and 89% in the control and treatment groups, respectively (P = 0.016), whereas the likelihood of survival without achieving the combined end points was 44 and 79% (P = 0.0006). Figure 1 shows the Kaplan-Meier analysis of the probability of achieving an end point and attaining remission in the two groups. Relapses were noted in four patients in group 1 and in eight patients in group 2 5.4 ± 6.2 mo after the first remission; these patients were treated with addition of ACEI. Four group 2 patients received oral prednisolone at 1 mg/kg per d for 6 to 8 wk. Two patients had two and one had three relapses. A total of 13 group 1 and 30 group 2 patients were in remission until the time of final follow-up. Kaplan-Meier plots showing probabilities of dialysis-free survival (A), survival without reaching either end point (B), complete remission (C), and complete or partial remission (D). Solid line, group 1; dashed line, group 2. Analysis of the effect of patient age, gender, disease duration, degree of proteinuria and serum creatinine at the time of randomization, histologic scores (disease stage and severity of interstitial lesions), and treatment showed that only the last was significantly associated with the probability of achieving a remission (P < 0.001). Figure 2 shows plots of the trends in proteinuria and estimated glomerular filtration rate (eGFR) in the two groups during the follow-up period. Compared with baseline, group 2 patients exhibited a significant decline in proteinuria within 6 mo. A significant divergence between the two groups in terms of proteinuria became apparent within the first year, and the gap widened during the follow-up period. In group 1, the eGFR was significantly lower than group 2 from 4 yr onward. The course of proteinuria (A) and the Modification of Diet in Renal Disease (MDRD) estimated GFR (eGFR; B) during the follow up-period. ▪, group 1, ▴, group 2. *P < 0.05; #P < 0.01; **P < 0.0001. Table 2 shows the frequency of patients with selected clinical abnormalities and quality of life as indicated by the visual analogue scale. Group 2 patients exhibited significantly lower prevalence of edema, hypoalbuminemia, hyperlipidemia that required therapy with statins, and ACEI/ARB use and recorded better quality-of-life scores at various time points. More group 1 patients developed hypertension that required drugs for control. The actual mean BP values were not different between the two groups either at baseline or during follow-up (data not shown). A total of 15 group 1 patients elected to receive the experimental protocol 24 to 54 mo after initial randomization. All of them had nephrotic-range proteinuria at the time of treatment. The serum creatinine was 1.7 ± 0.4 mg/dl, with two having shown doubling of serum creatinine. Of these, seven achieved remission (three CR, four PR), two progressed to ESRD, and another three showed doubling of serum creatinine. On “as treated” analysis, the remission rates were 66% (CR 29%, PR 37%) and 29% (CR 6% and PR 22%) in treated and untreated groups, respectively (P < 0.0001). The likelihood of survival without reaching a combined end point was 76% in treated and 35% in untreated groups (P = 0.0004). Infections were the most frequent complication, In group 1, 14 episodes (five respiratory tract infections, three urinary tract infections, one gluteal abscess, one bacterial meningitis, one bacterial peritonitis, one pulmonary tuberculosis, and two septicemias) were noted in 11 patients, and 10 episodes (three respiratory tract infections, five urinary tract infections, one pyomyositis, and one disseminated tuberculosis) were encountered in seven patients of group 2 (P = 0.35). Thrombotic episodes were seen in four patients in group 1 and three in group 2. No evidence of malignancy was seen in either of the groups during the follow-up period. A total of four (three control and one treated) patients died. The single group 2 patient had a sudden cardiac death at home 1 yr after completing the treatment protocol. Two group 1 patients died of advanced uremia and one of severe pneumonia that led to respiratory failure. This study presents independent confirmatory evidence through an RCT that a combination of steroids and cytotoxic therapy favorably affects the long-term natural history of IMN. Treated patients also experienced significant improvement in symptoms and quality of life. It is generally agreed that patients who have IMN and have never had nephrotic syndrome have a good prognosis (20,21). However, opinions about natural history of untreated patients with IMN and nephrotic syndrome are variable. In one study (18), 65% of patients who were followed up for >5 yr developed spontaneous remission of proteinuria, and the estimated 5-yr renal survival rate was 88%. Both patients with and without nephrotic syndrome were included in this study. In the study of Ponticelli et al. (17), however, permanent remission and renal survival among untreated patients who had nephrotic syndrome and were followed up for >10 yr were 33 and 60%, respectively. 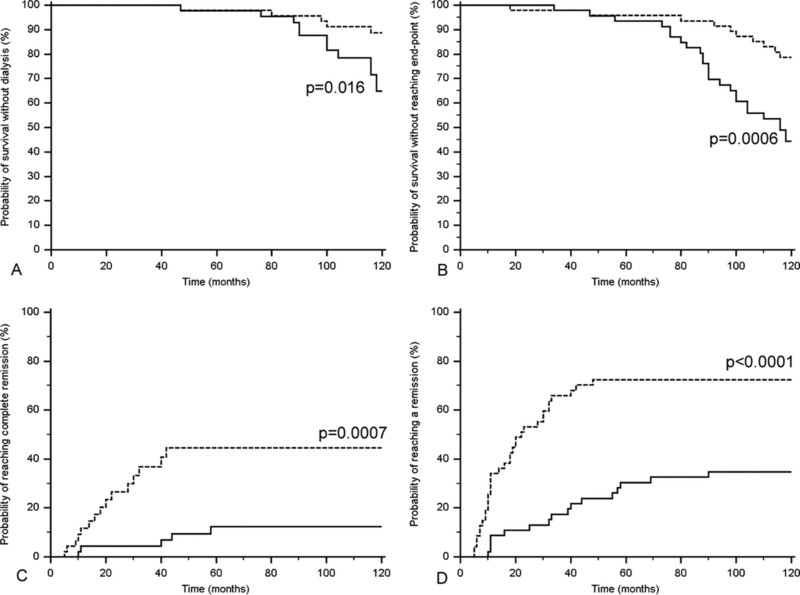 Pooled data from several studies show that approximately 50% of patients with nephrotic-range proteinuria exhibit deterioration in renal function, and the corrected 10-yr renal survival varies between 49 and 63% (22). Our results also support this finding, with evidence of disease progression in a significant proportion of untreated cases; the 10-yr dialysis-free survival was 74%, and survival without dialysis or doubling of serum creatinine was 41%. There is sufficient evidence to indicate that deterioration in renal function (as indicated by increase in serum creatinine level) is almost invariably followed by progression to ESRD in patients with IMN (23,24). The survival advantage noted in the treatment group in our study is similar to the one reported by Ponticelli et al. (17), the study with the most compelling evidence in favor of using steroids and an alkylating agent for patients with IMN and nephrotic syndrome. Ten-year follow up data in that study showed a probability of surviving without ESRD at 92% in treated patients and 60% in control subjects. A recent Cochrane review (19), however, concluded that there was only weak evidence in favor of alkylating agents in inducing remission of proteinuria, especially in those with preserved renal function; but renal failure, ESRD, and death were not favorably influenced by any of the cytotoxic agents. In a subsequent article, Buf-Vereijken et al. (22) pointed out that the results of the Ponticelli trial were overshadowed by three other RCT (11,25,26) in this review. The number of cases in two of these was small, and the follow-up was only 12 and 24 mo (11,25). It is therefore inappropriate to use these studies to analyze the effect of treatment on long-term preservation of renal function. Of note, both studies documented significant reduction in proteinuria in the treated group. In the third study (26), control patients had been studied retrospectively, diminishing its value as an RCT. In addition to these, small studies (not RCT) have shown the favorable effect of alkylating agents on the course of IMN (7,27). Our protocol was one of the two 6-mo treatment protocols that consisted of alternate months of methylprednisolone and either chlorambucil or cyclophosphamide used by Ponticelli et al. (13,17). In a comparative study, 12- and 30-mo remission rates were similar, but the frequency of adverse effects was three-fold higher in the chlorambucil group (13). du Buf-Vereijken reported 86 and 71% renal survival rates at 5 and 7 yr, respectively, in a cohort of 65 patients who had IMN and nephrotic syndrome and renal insufficiency that were treated with steroids and cyclophosphamide (7). The criteria for selecting patients with IMN for therapy remain a matter of debate. It has been suggested that aggressive treatment should be reserved for patients with persistent high-grade proteinuria and/or deteriorating renal function (28,29). This approach has the potential disadvantage of exposing patients to the risks of complications of nephrotic state. It is now well established that prolonged proteinuria causes tubular damage as a result of the intrinsic toxicity of albumin, which may incite tubulointerstitial inflammation, progression to interstitial scarring, and subsequent deterioration in renal function. In this study, all patients had nephrotic syndrome for >6 mo, and the mean Modification of Diet in Renal Disease (MDRD) GFR values were 84 and 89 ml/min, respectively, in the two groups at the time the treatment was started. Whether introduction of cytotoxic agents after GFR has deteriorated will be equally effective in ensuring preservation of disease progression remains unknown. In the small number of group 1 patients who later received the intervention protocol, the remission rate was not as good as in the original cohort. In their study, du Buf-Vereijken et al. (7) attributed the comparatively lower 10-yr survival figures in treated patients to the higher initial serum creatinine values and suggested that the survival could have been better had these patients been treated earlier. Only long-term randomized trials that look into the merit of “early” versus “rescue” therapy can definitively answer this question. Better indicators than degree of proteinuria and/or renal function for identifying patients who are at risk for progression are desirable. A notable finding of the study was demonstration of the salutary effect produced by amelioration of symptoms and lower medication use in the treated patients. In our study, control patients experienced hypertension, edema, hypoalbuminemia, and hyperlipidemia that required drug therapy with higher frequency. This adversely affected their general sense of well-being and reduced productivity as reflected by the poorer quality-of-life scores and resulted in more frequent hospital visits. This aspect has not been evaluated in other studies, which have concentrated on the effect of treatment on patient and renal survival. To avoid any confounding effect on the course of proteinuria during the time the experimental protocol was being administered, drugs that interfered with the renin-angiotensin system were not used in the first year. During the entire study period, a higher proportion of group 1 patients received these agents but did not experience a discernible salutary effect on proteinuria or renal function. Most studies on treatment of IMN have not clearly indicated the policy of using these agents. A few studies have assessed the role of ACEI on the course of IMN but failed to show any favorable effect on prognosis (7,30–32). In one study (33), captopril use for 12 mo reduced urinary protein excretion in 14 patients with IMN. However, of the seven patients who had nephrotic-range proteinuria and could take the drug for 12 mo, >50% reduction was noted in only three. Most studies have reported increased likelihood of infections and malignancy in patients who were treated with steroids and cytotoxic agents (7,13,15,17). We, however, did not note any difference in the infection risk between groups. It is possible that a lowered immune status as a result of a continued nephrotic state in the control group counterbalanced the increased risk as a result of immunosuppressive drug use. We suggest that a properly supervised 6-mo course as used in this study does not increase infection risk and might actually reduce it by inducing remission of the nephrotic state. None of our patients developed any malignancy. In addition to providing independent confirmation of the utility of a treatment regimen that contains steroids and alkylating agents, this trial also sets the benchmark against which new treatment protocols must be compared. A variety of regimens that incorporate immunosuppressive drugs that are used in the transplant population (e.g., cyclosporine, tacrolimus, mycophenolate mofetil) have been proposed for treatment of IMN. An important feature of these drugs is their high cost. To justify their use, therefore, their superiority would need to be proved in randomized trials with the current protocol in terms of efficacy or adverse-effect profile. Untreated IMN with nephrotic syndrome is associated with a high risk for deterioration of renal function. Treatment with a 6-mo regimen of cyclophosphamide and steroids induces remissions in a high proportion and arrests progression of renal insufficiency. In addition to improved renal survival, the regimen is helpful in amelioration of symptoms and complications related to nephrotic state and improves quality of life.